Sometimes I just get the feeling that a new technology has hit a pricing sweet spot and is poised to go mainstream. My tech-spidey sense is tingling after seeing the new Sony Grand Wega LCD DLP rear-projection HDTVs. They're less than half the price of comparably sized plasma TVs, and while they might not be quite as nice a picture or quite as thin, they're close enough in all respects that it's difficult to justify climbing the price ladder for the plasma. And while other manufacturers have already jumped into this market segment with comparably priced models (e.g. 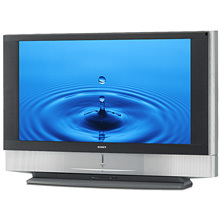 Samsung), the Sony brand name carries greater sway with the mainstream home electronic shopper. These things are going to sell like hotcakes. The 70" retails for $6999.99, the 60" for $3999.99, the 50" for $3299.99, and the 42", likely to be the most popular model, for $2799.99. Perhaps finally, the HDTV revolution in the U.S. is poised to gain momentum. When people tell me they're ready to upgrade to HDTVs in the next six months, I'll probably point most of them to this product line.